12/13 May 2018 - will you be there? Inspired? Come and join the challenge. You can do it! The Walk Across Scotland had to be, first and foremost, enjoyable to all participants and also raise money for Macmillan. We felt that if we could get a group of people sufficiently interested, and if we offered as much support as possible, then the hard work of walking or cycling was left to them. Support in the first ever walk was to book participants into various small hotels in Ullapool, all meeting in the evening in one of the pubs and having a ceilidh. Yes, music was much to the fore in the form of at least an accordion, very often guitars and violins and of course the inevitable sing song. We even had song sheets, and Ron Clowes very obligingly always led the singing. We stayed a second night in the Bridge Hotel, Bonar and an even more enjoyable ceilidh took place because by then we were elated – we had done it. We also doubled up with cars, all helping each other to start of walk – there were no mini buses ferrying us! 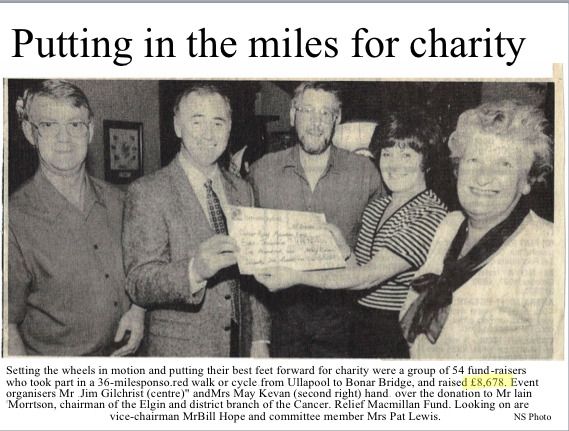 The first walk in 1996 was in memory of May Gilchrist’s first husband Ian Kevan who died of cancer in 1993. May wanted to dedicate something “alive” to Ian and hit on the idea of organising a walk in his memory and at the same time raise money for a worthwhile cause. 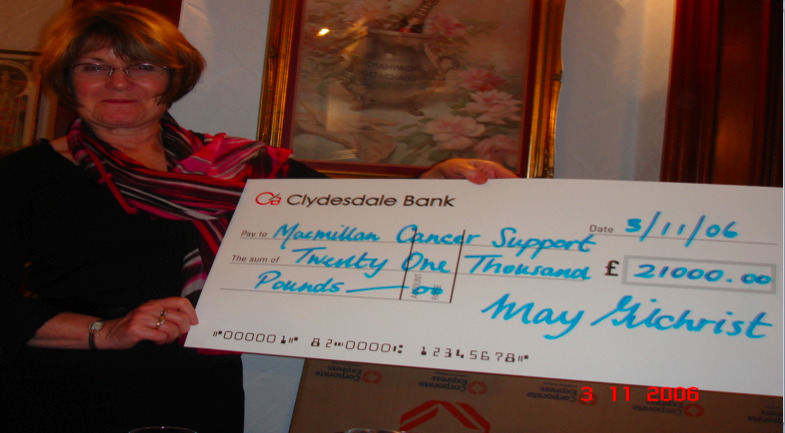 May was helped by two friends, Jim Gilchrist and Kenny Ferguson (Macmillan nurse) and planning started in 1995. May and Jim visited the area, meeting with landowners and discussing and researching the route. The original route was through a valley further south but this also involved a hill climb and would have proved a lot more strenuous than the existing route. It was on one of these visits that May and Jim met a ghillie who directed them to the route now taken. Participants are asked to raise money through sponsorship. There is no minimum amount, but you are encouraged to have your sponsor money gift-aided (if your sponsor pays income tax). This adds another 25% to what you raise. There were two obstacles facing the organisers. How could we walk 36 miles without offering overnight accommodation? And how could we get across a river which flows through the middle of the walk? The former was overcome by having the participants attempt the last 11 miles, from Croik to Bonar, on day one, taking them across to Ullapool by coach to their accommodation and walking 25 miles on day two. On the original walks we doubled up with cars, leaving some at Croik for walkers to be picked up as they completed the second day. The idea of having scouts build a bridge across the river has proven to be one of the highlights of the walk. Seeing the scout tents after having walked 14 miles is a haven in a wilderness. The first tent was merely an open ended small affair. Nowadays, the tent is more a marquee with seats provided for the participants both inside and out. To date, the annual trek from coast to coast has raised over £296,000.